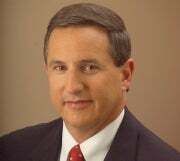 Mark Hurd is stepping down as CEO of Hewlett-Packard following an investigation into claims that he sexually harassed a former contractor to the company. The investigation, conducted by outside legal counsel and the company's general counsel and overseen by the board, found that Hurd did not violate HP's sexual harassment policy but he did violate HP's standards of business conduct, the company said. Cathie Lesjak, HP's CFO, will serve as interim CEO while a search committee looks for a permanent replacement for Hurd. She will retain her CFO position and has asked not to be considered for the permanent position. "As I step into the role as interim CEO, I've never had more confidence in the company's future," she said in a conference call about the announcement. HP discovered the situation recently when outside legal counsel sent a letter to the company on behalf of the contractor on June 29. The next day, the board was notified and launched the investigation. The investigation discovered that Hurd had a "close personal relationship" with a marketing contractor that he did not disclose to the board, Mike Holston, HP's general counsel said. The consultant does not wish to be named, he said. It also revealed that there were numerous instances where the contractor was paid or reimbursed without performing work. There were also inaccurate expense reports from Hurd meant to hide his personal relationship with the contractor, Holston said. That evidence pointed to "a profound lack of judgment" by Hurd, he said. "Based on all of this, the board concluded and Mark agreed that it was impossible for him to be an effective leader and he has stepped down," he said. HP would not reveal the amount of money improperly expensed by Hurd and the contractor but implied it wasn't significant. "Let's be clear, the amount of expenses we're talking about are not material to HP," Holston said. "It wasn't the dollar amount that drove the board decision. The fact that drove the decision for the company had to do with integrity, it had to do with credibility and it had to do with honesty." Company leaders are satisfied that the investigation showed that the pattern of improper expense reports did not extend beyond Hurd and the contractor, he said. The executives stressed that the company is financially sound and that Hurd was not solely responsible for the company's past successes. "The announcement today has nothing to do with the operational performance of the company but is really all about Mark's behavior and judgment," said Lesjak. In attempting to distance the company from Hurd, HP board member Marc Andreessen said: "HP is not about any one person." Lesjak reiterated that point. "Mark was a strong leader but at the end of the day he didn't drive the initiatives. It was the organization that supported Mark that drove those initiatives," Lesjak said. So far, no civil or other litigation has been filed against Hurd, Holston said. "As the investigation progressed, I realized there were instances in which I did not live up to the standards and principles of trust, respect and integrity that I have espoused at HP and which have guided me throughout my career," Hurd said in a statement.